A team competition for undergraduate college students inspired by the working of the Federal Open Market Committee. It is designed to encourage students to learn more about the U.S. macroeconomy, the Federal Reserve System and the implementation of monetary policy. The School Outreach Initiative brings New York Fed staff into the community college classroom to give accessible and informative 45-minute presentations on such topics as the role of the Federal Reserve, its history and monetary policy. A tool that links videos from top researchers and senior staff at the New York Fed to chapters of popular economics textbooks. U.S. student loan debt totals over $1.3 trillion. However, this number masks a diversity of consumer experiences with student debt regionally and demographically. 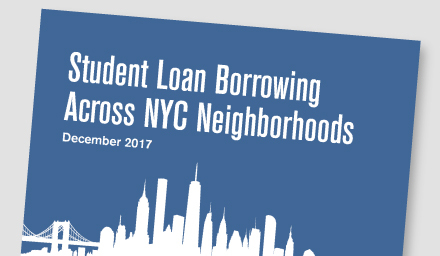 This report is the first comprehensive examination of student loan debt across New York City at a neighborhood level. The analysis shows comparatively high rates of delinquency and default and slow repayment rates among borrowers with lower student loan balances, older borrowers, and those who live in lower-income areas. The New York Fed sponsored a pilot video contest in the Greater Rochester area about jobs in demand. The contest challenged teams of college students from Monroe Community College, Finger Lakes Community College and Genesee Community College in the Greater Rochester Area to produce 30-second videos about middle-skill occupations. The Federal Reserve in the 21st Century symposium gives college professors a chance to hear presentations from economists and senior staff of the New York Fed, ask them questions and participate in networking opportunities. Tours introduce students and the general public to the Federal Reserve System and the New York Fed's role in setting monetary policy, promoting financial stability and serving communities to advance economic growth.